Begin by standing in tadasana (mountain pose). Bend forward, hinging from the hips and keeping a flat back, until your hands can touch your feet. It’s okay to bend your knees if you need to. Wrap the thumb and first two fingers of each hand around your big toes and squeeze. Rise up until your elbows are straight; straighten your back, and feel your belly hollow out, as if your belly button were reaching back to touch your spine. Gently lower forward, gripping the toes and dropping the elbows out to the sides. If your legs aren’t straight or your hamstrings are tight, keep your front torso long and your back straight, and work on trying to straighten the legs; if your legs are straight, you can deepen into the pose and bring your head towards your knees. Raise up a little, unhook your fingers, and slide your whole hand underneath your foot, so that each foot is palm-to-palm with each hand. It’s okay to bend your knees if you need to. Continue trying to straighten your legs, or, if your legs are straight, deepening into the pose. To come out, release your hands and rest them on the floor for a moment until you feel stable. Bring your hands to your hips; come halfway up to straighten your back, and slowly lift back up to standing. Take a small backbend if it would feel good: bend back from the heart, not from the waist. Return to tadasana. This pose stretches the hamstrings and calves, helping to lengthen and strengthen tight muscles. 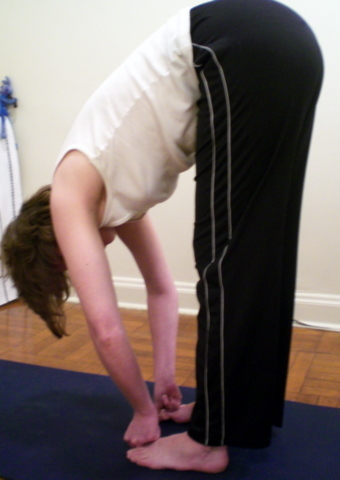 Forward bending can be beneficial for digestion and the internal organs. Forward bends also help to calm the mind. The Gorilla Pose variation can improve circulation in wrists and hands. Students with back injuries (particularly lower back injuries) should use caution. Pregnant students should take care in any forward bend. Those with low blood pressure should come out of this pose slowly and carefully to avoid getting dizzy. i have never heard padahastasana called gorilla pose – HI-larious. I never heard it called anything else!